On a recent trip to the back woods of Canada, CAA member David Nuti did a little fishing and a little stargazing. We don’t know how the fishing went, but when it came to sky-watching, the “big one” did not get away. 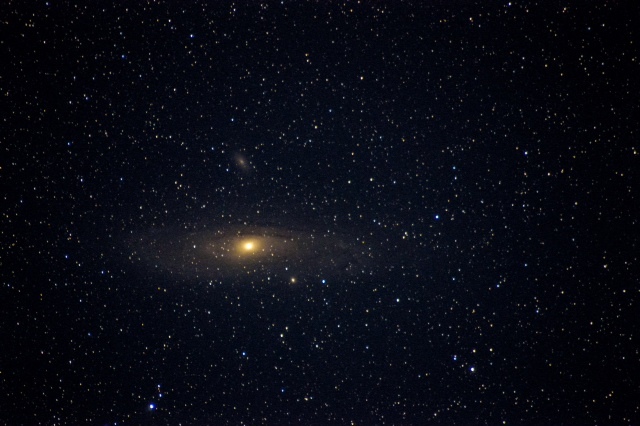 Nuti shared a beautiful astrophotograph with the membership and we’re sharing it here: the Great Andromeda Galaxy (M31) appears as a beautiful cloud in the center of this image. Closer inspection reveals he caught a couple of Andromeda’s “satellite galaxies” — smaller “island universes” captured by Andromeda’s enormous gravitational attraction. Messier 110 (M110) is seen here as a glowing spot directly above Andromeda’s glowing center. M32 appears as a golden spot little below and to the right of the galactic giant. Some curving structure may be seen in Andromeda’s faint disk of stars and dust. This entry was posted in Uncategorized and tagged Andromeda Galaxy, astronomy, astrophoto, Canada, M110, M31, M32, member photographs, photograph. Bookmark the permalink.